DETECTION OF MALIGNANCY IN SOLITARY THYROID NODULE. Background: The presence of a solitary thyroid nodule is a risk factor for malignancy. The major challenge in management of the solitary thyroid nodule remains the assessment to which nodules require surgical excision and which can be followed conservatively. The fine needle aspiration cytology (FNAC) is one of the most important advances in the management of the thyroid nodules ,it has an accuracy rate greater than 90%. 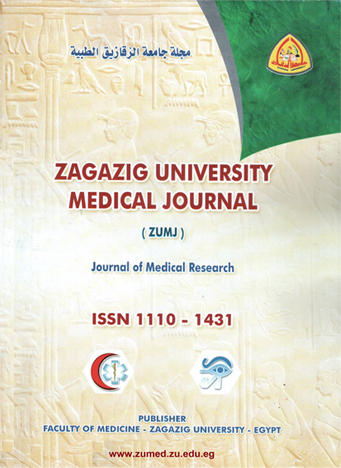 Objective: to assess the predictive value of conventional clinical examination, laboratory investigation and cytology (fine needle aspiration cytology (FNAC) and histopathology) in the diagnosis of malignancy in the solitary thyroid nodule and its impact on the development of a surgical policy for proper management. Patients and methods:a total of 100 patients with solitary thyroid nodules were thoroughly examined clinically after taking detail history and FNAC; all the patients were subjected to surgery after preoperative preparation and anesthesia checkup. Thyroidectomy specimen was evaluated by histopathologicalexamination . Exclusion criteria: multinoduler goiter, hypo and hyperthyroidism, patients refuse FNAC , other investigation and patients unfit for surgery . Statistical analysis: SPSS version 11. Results:In the present study both FNAC and histopathology was done in 100 patients of solitary thyroid nodule. Out of 100 cases, 86 cases were benign and 14 cases were malignant on histopathology. On cytology 84 cases were benign, 11 cases were malignant, and five cases were suspicious smear , two of them were (follicular adenoma) false positive case. Sensitivity was 100% , specificity was 97.6%, accuracy was 98%,positive predictive value was 87.5% and negative predictive value was 100%.Conclusion: Significant proportion of solitary thyroid nodule (14%) was malignant. So, careful assessment of thyroid nodule is important for early diagnosis. All cases with solitary thyroid nodules should have FNAC as pre-operative diagnostic method to reduce the number of patients referred for surgery.